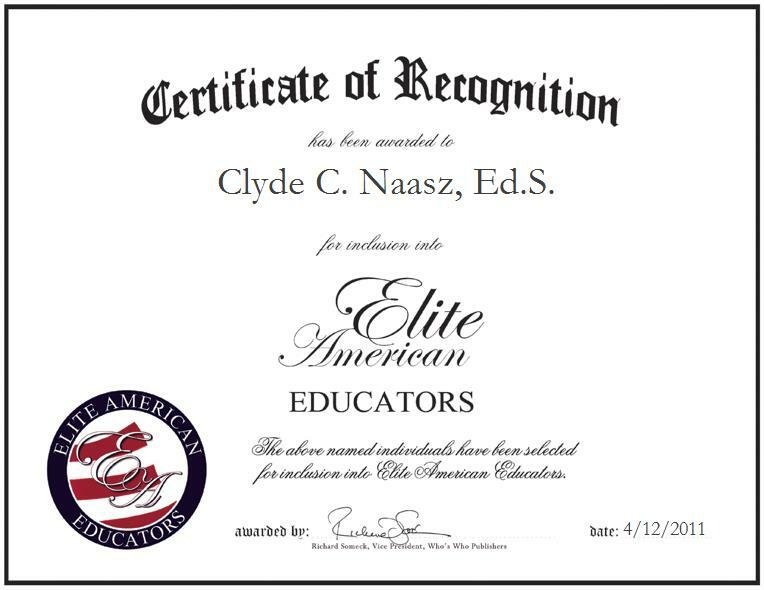 Fort Yates, ND, April 12, 2011, Clyde Naasz, Assistant Superintendent and Title I Coordinator of Standing Rock Fort Yates Community School, has been recognized by Elite American Educators for dedication, achievements and leadership in education administration. Mr. Naasz has dedicated 34 years of his life to putting the priorities of students above all else. He holds the belief that a person should work in education because they are passionate, otherwise, they should look for work in another industry. At Standing Rock Fort Yates Community School, he is relied upon to write grants for the school district and school systems, as well as oversee 50 state and federal programs, including Title I and E-Rate. He also holds experience in operating under a Joint Powers Agreement, which is a special education initiative used for school’s to meet their goals. When not administrating, Mr. Naasz takes great pleasure in coaching high school athletics. He attributes much of his success to his own personal experience playing sports at that age. He was named the 1991 to 1992 Boys Basketball Coach of the Year for Region 7 of the state of South Dakota for his coaching skills. More recently, he volunteers his time as a referee for high school basketball games. In 1977, Mr. Naasz completed a degree in secondary teacher business education, and physical education and health from Northern State University. He followed that with a Master of Science in Secondary Administration. Having completed an education specialist degree, he is pursuing a Ph.D. in school administration at the University of South Dakota. Additionally, he stays abreast of industry changes through professional affiliations with education associations, including the Missouri River Educational Cooperative, the National Association of Federally Impacted Schools and the Standing Sioux Tribe Education Consortium. He has also been invited to present at the National Read Right Conference, the National Spring NAFIS Conference and the TESL Conference. In five years, Mr. Naasz hopes to have dorms built for his school, which is struggling with AIPs. He would like to be remembered as a person who is hard working, caring and concerned for all students.